The next time you pull up at a temporary set of traffic lights, it won't just be red you're seeing, but the latest in solar technology - or at least that's the aim of a new joint venture between two Kent firms. Last month Green Gate Access Systems, launched SOSEC®, the UK's first solar powered barrier and gate system - a revolutionary new approach to securing work sites. This month the Maidstone company and road safety specialist Highway Care, based in Detling, announce they are coming together to adapt the product for road construction and general highway use. SOSEC combines a five-metre automatic traffic barrier with optional drop skirt and LED lights to control vehicles, with a rugged, locked and self-closing gate for pedestrians, which can also be supplied as a gate or barrier on its own, depending on the site's needs. That technology is capable of being adapted for use beyond work sites, including retail, emergency and mining with temporary highway works seen as having great market potential. Green Gate Access Systems and Highway Care will showcase two products utilising the SOSEC system at the Highways Seeing is Believing (SIB) Show being held in Bruntingthorpe, Leicestershire on 9 and 10 November. These will include the standard SOSEC Combined barrier and gate for compound security and the new SOSEC highways version with 4m barrier and calming speed hump with flexible impact protection posts. The SOSEC system has already attracted interest from construction clients, including Kier Living, who trialled it on their Berryfields site near Aylesbury before rolling it out to over 30 UK sites to date. 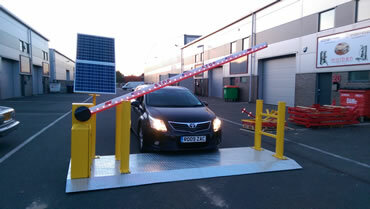 Green Gate Access Systems are hoping to replicate that success, by making in-roads into the temporary highways market. SOSEC's solar power and power storage ability are unique, and allow the product to be used up to 900 times a day, all year round, even through a British winter. It can also be delivered as a battery only version for up to one month's use in very temporary sites. 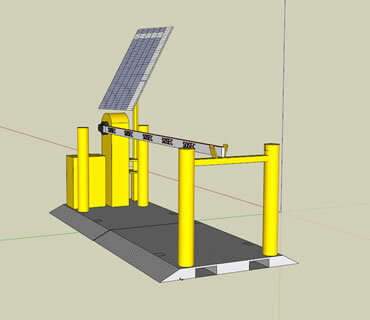 Green Gate Access Systems developed the SOSEC concept to answer a growing need to provide public safety and work site security where power provision is not practical, but security demands are high. To find out how SOSEC can improve your security, please contact us or call 08456 800269.